The Sierra de las Nieves karst system is a high-relief Mediterranean karst that hosts important botanical diversity, including the unique Spanish fir Abies pinsapo. Vegetation is mainly controlled by the soil development and climatic conditions. In turn, the soil is controlled by lithology, fracturing, weathering and slope. There is also positive of soil and vegetation feedback in the epikarst development. 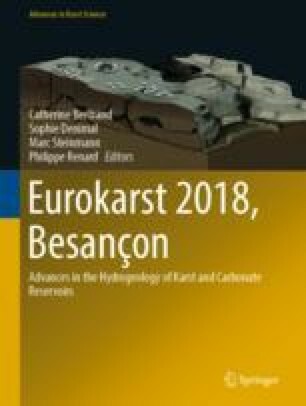 This study focuses on the spatial variability of vegetation in a karst massif and its relationship with the main lithologies, karst depressions, fracturation density and slope. Contingency analysis shows degrees of association between the plant species studied and the other parameters. Thus, plant species preferences have been found for certain lithologies, degree of fracture development, karst depressions of ground slope. This work was supported by project CGL2015-71510-R (Ministerio de Economía, Industria y Competitividad of Spain). IGME (2015). Cartografía geológica de España. http://info.igme.es/cartografiadigital/datos/geode/docs/GEOL_INFO.pdf. Junta de Andalucía (JA) (2017) Environmental and Land Planning Counseling. http://www.juntadeandalucia.es/medioambiente/site/rediam/menuitem.04dc44281e5d53cf8ca78ca731525ea0/?vgnextoid=937b60e749e0a210VgnVCM2000000624e50aRCRD&vgnextchannel=36faa7215670f210VgnVCM1000001325e50aRCRD&vgnextfmt=rediam&lr=lang_es.